You’re not worried about getting sick from your #summer food BBQs and Picnics? Not to scare you, but you probably should. According to the CDC there are approximately 48 million cases of foodborne illness annually that’s 1 in 6 Americans. So here are a few tips from the FDA, foodsafety.gov and a few other sources (including a fantastic interview on NPR with Angela Fraser, a professor and #food safety specialist at Clemson University in South Carolina) to keep your barbecues, picnics, and outdoor eating safe during the summer months (and throughout the year) . Buy a #Cooking Thermometer: Since food temperature is so critical, you should purchase a thermometer that tells you the internal temperature of your food. They vary in sophistication and price, but you can get a basic one (that does a great job) for $5 or less. – Foods like chicken salad and desserts in individual serving dishes can be placed directly on ice, or in a shallow container set in a deep pan filled with ice. Drain off water as ice melts and replace ice frequently. – Refrigerated perishable foods like luncheon meats, cooked meats, chicken, and potato or pasta salads should be packed in an insulated cooler with several inches of ice, ice packs, or containers of frozen water, and kept at 40°F or below to prevent bacterial growth. Preserve the cold temperature of the cooler by replenishing the ice as soon as it starts melting or adding more ice packs. – It’s a good idea to pack meat, poultry, and seafood while still frozen so that they stay colder longer. – Pack frequently used drinks in one cooler and perishable foods in another cooler. Keeping the perishable foods sealed with ice allows them to stay cool longer until you are ready to cook. – Place the cooler in the shade or under shelter (but not in the trunk of your car) and out of the sun to help keep foods cold. – If a cooler chest is not an option, consider taking nonperishable foods such as fruits, vegetables, hard cheeses, canned or dried meats, dried cereal, bread, peanut butter, crackers, and a refreshing beverage. – If you buy take-out foods and don’t plan to eat them within 2 hours of purchase, chill the food in your refrigerator before packing it for your outing. – In general, regardless of your cooking situation, you need to keep your hands clean. Make sure to wash your hands with hot, soapy water before handling food and after using the bathroom and handling pets. You can also pack clean, wet, disposable wipes and bleach wipes for cleaning hands and surfaces. – When packing the cooler, wrap raw meats securely; do not allow raw meat juices to come in contact with ready-to-eat foods. – Thoroughly wash plates, utensils, and cutting boards that came into contact with raw meat or poultry before using them again for cooked food. This is particularly important to remember if you take raw food on a plate to your grill. Don’t put the grilled food back on the same plate until it’s been washed. – Hot food need to be kept hot, at or above 140° F. Wrap the food well and place it in an insulated container until serving. Just as with cold food, these foods should not sit out for more than 2 hours (or 1 hour in temperatures above 90° F.) If food is left out longer, throw it away to be safe. – Cook hamburger and other ground meats (veal, lamb, and pork) to an internal temperature of 160 F, and ground poultry to 165 F.
– Cook steaks and roasts that have been tenderized or boned to an internal temperature of 160 F for medium, and 170 F for well done. Whole steaks and roasts may be cooked to 145 F for medium rare. – Whole poultry should be cooked to 180 F in the thigh. Breast meat should be cooked to 170 F.
– Cook meat and poultry completely at the picnic site. Partially cooking foods ahead of time allows bacteria to survive and multiply to the point where subsequent cooking cannot destroy them. – Raw meats, fish and poultry should be defrosted in the refrigerator (not at room temp), during cooking, using the microwave defrost feature, or under cold running water (which can be a real waste of water, so avoid if possible). – Cooking frozen meat or poultry will take approximately 50 percent longer than the recommended time for fully thawed or fresh meat and poultry. – If you’re using a public grill, make sure to bring a clean piece of aluminum foil for each type of food you’ll be cooking. Place it over the grill, poke some holes in the foil, spray with a bit of cooking spray (before you light the grill) and put whatever you’re grilling on top. – Marinate foods in the refrigerator – never on the kitchen counter or outdoors. In addition, if you plan to use some of the marinade as a sauce on the cooked food, reserve a portion separately before adding the raw meat, poultry, or seafood. You can spread the “safe” unused marinade on the cooked foods using a clean brush, but never reuse marinade that’s contained raw food. According to Foodsafety.gov, “Poultry and cubed meat or stew meat can be marinated up to 2 days. Beef, veal, pork, and lamb roasts, chops, and steaks may be marinated up to 5 days. – Grill immediately after “partial cooking.” If you partially cook food on top of the stove or in the oven to reduce grilling time, do so immediately before the food goes on the hot grill. – Keep “ready” food hot. 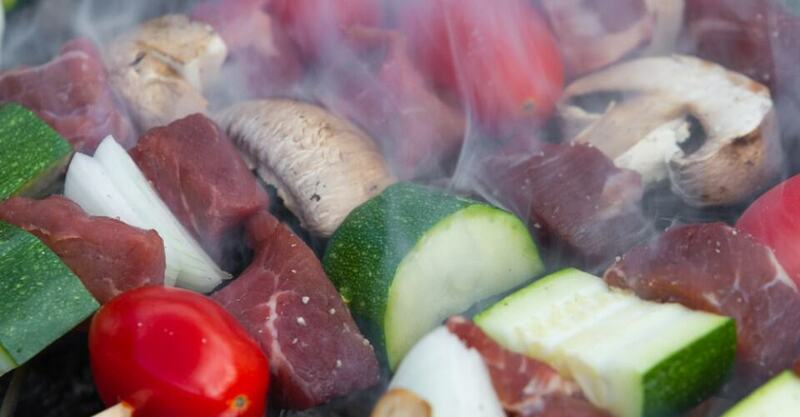 Grilled food can be kept hot until served by moving it to the side of the grill rack, away from the coals. Check for foreign objects in food. If you clean your grill with a bristle brush, check to make sure that no detached bristles have made their way into grilled food. – Keep your grill clean.